December 5 will be a fateful day in the saga of the Dakota Access Pipeline (DAPL) protests, as the Army Corps of Engineers announced they will close all lands north of the Cannonball River, which includes the Oceti Sakowin protest camp. We can expect that the camp will be forcibly cleared and protesters evicted by the same militarized police forces – and possibly National Guard – that have been acting as protection services for Energy Transfer Partners, the company behind DAPL. What makes this even more concerning is that veterans, possibly numbering in the hundreds, have committed to join the protests on Dec. 5-7 to stop DAPL and defend water protectors. They are organizing “like a military unit” and say they are prepared to take a bullet, rubber or otherwise. The gathering of militarized police forces protecting the 1,172-mile-long, 30” diameter oil pipeline is not just from North Dakota, but includes at least six other states — Wisconsin, Indiana, South Dakota, Minnesota, Wyoming, and Nebraska. This multi-state force is only possible by abusing a law meant to aid states in times of natural disaster. 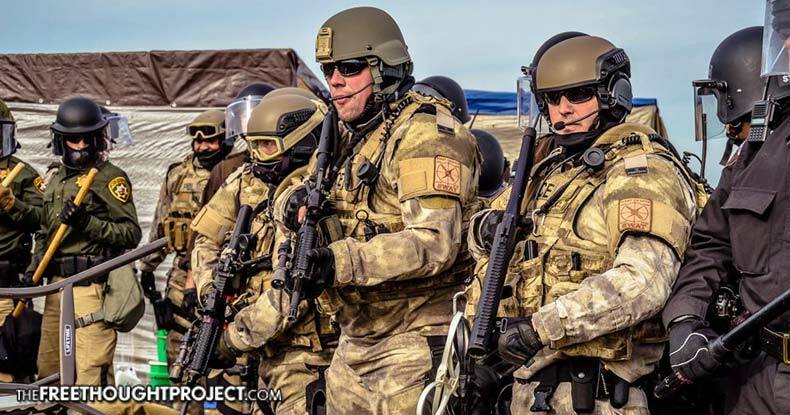 It’s costing millions of dollars to deploy of all these cops, complete with riot gear, armored vehicles and LRAD cannons, against peaceful Native American protesters. This peculiar situation begs the question: how are all these expensive deployments being paid for? It appears that at least some police departments are expecting to get reimbursed by the oil company, which would make them nothing more than mercenaries. All of this calls for further investigation into every penny of funding going into the militarized police crackdown at DAPL, which has inflicted serious injuries on protesters and arrested more than 400 people. As Unicorn Riot notes, the uncovered emails reveal that at least some of the cops indeed view themselves as mercenaries for a private oil company. In the interview, CEO Warren was absolutely sure their pipeline will be completed, even though the Corps of Engineers has delayed granting the easement to build under Lake Oahe. the drinking water source for the Standing Rock Sioux. “They will not stop our project. That’s naive. They’re not stopping our project,” said Warren. Despite already losing tens of millions of dollars due to delays caused by the protests, his oil company is willing to give the cops millions more for their services in brutalizing and rounding up protesters.